Much of the fighting of the Pacific War took place in areas that had very limited contact with the modern world. Though technically nationals of the various colonial powers, the indigenous population lived much the same way as it had for thousands of years, apart from a veneer of Christianity acquired from European missionaries, some limited trade with outsiders, and occasional bartering of labor (such as on copra plantations) for goods like cloth or tobacco. Most of these areas had inhospitable climates and terrain or lacked natural resources that might have attracted greater European interest. Captain V.F. Grant, the atoll commander, took a great interest in the natives, whose ranks had been thinned by the enemy's removal of the young and able-bodied of both sexes to Jaluit. His war diary has a Stevensonian touch: "29 February 1944. King Langlan, Queen and Royal Party were entertained at lunch by Captain Grant." He established a trading post where the Majurians could obtain gaily printed cotton (for their lava-lavas) and black twist tobacco, in return for pandanus-leaf baskets, mats, model canoes and other products of their skill. Thus the souvenir racket which develops wherever American bluejackets set foot was somewhat regulated. The King and Queen even rated a royal salute from Captain Grant's "Majuro Navy", consisting of four LCIs, ten LSTs, a small minesweeper and tug Arapaho. Modern readers may find Morison's attitude condescending, but it was quite typical of American attitudes of the day, which combined a sense of cultural superiority with a distaste for colonialism -- much as was the case in the Philippines and in China. The American attitude was certainly more benign than the Japanese treatment of indigenous peoples, as hinted at in the previous excerpt. With few exceptions, the Allies could count on the support of the indigenous population in most areas of the Pacific. Melanesia. The first Allied offensives of the Pacific War took place in the Solomons and New Guinea, which form the heart of Melanesia. The indigenous Melanesians are tall and dark-skinned with distinctive curly or woolly hair, and they speak a bewildering variety of languages, estimated at over 200 on New Guinea alone. However, these languages share common features, and most anthropologists believe the Melanesians share a common descent from inhabitants of Papua (eastern New Guinea) who settled the area at least 40,000 years ago. Many of the indigenous peoples of the Solomons had been converted to Christianity and gave significant assistance to Allied coast watchers and downed airmen. Future president John F. Kennedy was rescued by Melanesians following the sinking of PT-109. Solomon Islanders served as guides for tank/infantry teams on New Georgia. The New Guinea tribes were less reliably pro-Allied. While friendly Melanesians provided portage during the Buna campaign, and were particularly helpful in evacuating the wounded, the Orokaiva tribe of the Buna area were very hostile to Europeans and initially sided with the Japanese, providing them with laborers and scouts. This later changed due to Japanese mistreatment, particularly of women, and the Orokaiva proved unreliable as carriers on the Kokoda trail. Micronesia. The Gilbert, Marshall, and Caroline Islands constitute the heart of Micronesia. The Micronesians are less dark-skinned than the Melanesians and show more Oriental characteristics, reflecting their likely descent from ancient Formosans who migrated to the Philippines and on to what is now Micronesia. Genetic studies reveal surprisingly little intermarriage with the Melanesians, and the languages of Micronesia belong to the Austronesian family rather than the Papuan family. The Micronesians of the Gilberts and Marshalls were treated harshly by the Japanese and seemed not unhappy at the arrival of the Allies, although they cannot be said to have given much active assistance. The Micronesians of the Carolines had had their standard of living sufficiently raised under the Japanese mandate that they were reasonably loyal subjects of the Emperor, though, again, they cannot be said to have actively opposed the Allies in those few areas (Palau and Ulithi) that were occupied by the Allies during the war. The Americans brought an immense influx of material riches to the islands of the Pacific, including an abundance of food that was freely shared with the indigenous peoples. In Micronesian culture, the sharing of food is of immense social significance, and the American generosity was misread in ways that caused some signficant postwar social and political difficulties. Polynesia. The Japanese offensive never reached Polynesia, which is located roughly in the triangle formed by New Zealand, Hawaii, and Easter Island. However, significant number of Polynesians fought as regular soldiers in the armed forces of New Zealand and the United States. The Polynesians are thought to have descended from the same Formosan sailors as the Micronesians, though there are important distinctions in language and culture. Burma. There were numerous indigenous tribes in Burma when it was overrun by the Japanese. The Shan tribes of eastern Burma, who had strong ethnic and cultural ties to Thailand, were strongly pro-Japanese. By contrast, the Kachin and Naga tribes of northern Burma sided with the Allies, largely as the result of Japanese atrocities. The success of the OSS in working with the Kachins was one of their few real triumphs in the war against Japan. The Naga were a warlike group of tribes, living in villages in the mountainous region of northern Burma and northeast India. They were one of the few indigenous peoples of whom there were still credible reports of headhunting in the 1940s. When journalist Eric Sevareid was forced to bail from a crippled transport aircraft on 2 August 1943, he and his fellow passengers parachuted into Naga territory. The local British district supervisor later told Sevareid that the Nagas from one of the villages in the area had taken 106 skulls from neighboring villages in 1942. The British Force 136 worked more closely with the Karen people, who were an ethnic minority living mostly in southern Burma or along the border with Thailand. Many of the Karens had converted to Christianity, and they were more pro-European than most ethnic Burmese. 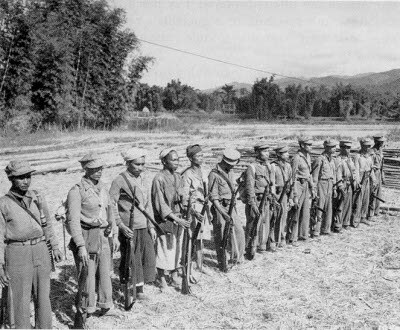 The Japanese distrusted them from the start, and the Burma Independence Army tried to disarm them. Two Karen villages, Kanazogon and Tayagon, were razed to the ground and their inhabitants massacred, creating lasting postwar enmity between the the ethic Burmese and the Karen. There were 2,000 of them, cheering, weeping, laughing, singing. They had been living in lean-tos and thatched huts built in the mud to either side of a sluggish stream. They had had little food, no medical care. They were clothed in rags. They were weak, racked by continual coughing fits— victims of malnutrition, malaria and tuberculosis. Their bodies were sticks of bones and their olive skin was drawn drum-tight. But this thirty-first of July was the day they had awaited for nearly three years. When they saw the American soldiers coming through the trees, they hobbled to their feet with glad cries. One of the Chamorro refugees was the elderly Gaily R. Kamminga, a former member of the Guam Congress, who had taken considerable personal risks to preserve the American flag that had been flying over Piti Navy Yard on the day of the Japanese invasion. Philippines. The Philippines were the home of a number of tribal peoples, including the Negritos, a dark-skinned race of very short stature and uncertain ancestry (though genetic studies suggest descent from the first humans to enter Asia from Africa.) TheIgorot ("mountain people") were a warlike Austronesian group who, according to Alexander (2009), killed Japanese soldiers and took their jawbones as trophies. The Igorotes worked well with the Alamo Scouts, but Alexander (2009) also alleges that the Igorotes killed two American escapees from Bataan when one of the men began a sexual relationship with a married Igorote woman.